Originally posted by Laura Emerson here. Rural property owners generally pay lower taxes than city people for the logical reason that they derive fewer municipal services. That’s a fair trade, isn’t it? Among services NOT available to many on-road, (and certainly not for off-road) properties is subsidized fire protection. This has implications not only for structural preservation but also for insurance. Be sure to inquire about both before you buy or rent that attractive remote property! Then, plan to take charge of your own fire safety. To help, most counties, boroughs, and parishes in the country have a Division of Emergency Services with useful information pertinent to hazards in that particular region. Some of the following suggestions are derived from the “Wildfire Mitigation Program” of my borough in Alaska. In addition, local fire departments are terrific resources. A local volunteer fireman actually helped construct some of our early buildings and alerted us to many of the elements described below. A few years later, in exchange for a hot meal, my husband flew a local fire chief out to assess the success of our fire mitigation efforts and any neglected hazards. He even helped us chop down a huge dry and dying tree! A great resource is Firewise. Whether your property has existing buildings or you will build from scratch, plan to assess fire hazards and find ways to reduce them through prudent use of: (a) firebreaks and landscaping, b) hardscape, (c) flammable debris removal or storage, (d) well marked and accessible roads and driveways (if on the road system), (e) well positioned fire suppression systems (f) primary and secondary methods to report the emergency, and, finally (g) exit plans and provisions. a) Firebreaks and Landscape: The recommended width of a fire break is at least 30 feet around buildings. (This is referred to as “defensible space zone 1”) (However, since fire rises, buildings on a steep slope need to triple that distance below the structures). I have first hand knowledge of the reason. 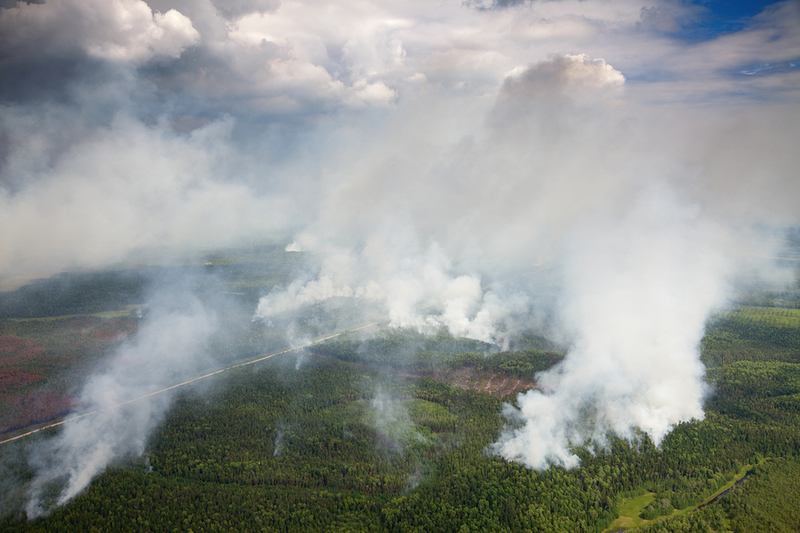 This summer, the area of Willow, Alaska suffered a wildfire of several thousand acres. Scores of buildings and vehicles were damaged. About 2,000 people were evacuated. As we fly low over that area on a regular basis, and then drive among its roads, we see clear evidence where the fire had “jumped” narrow roads and driveways but had not crossed broad cul de sacs, parking lots, or grass air strips. The clearing around your buildings does not have to be paved or graveled – it can have landscaping – but those plantings should be intelligently selected and well maintained. Some ground covers, shrubs, and trees are more fire resistant than others. Ask at a local nursery. A “fire resistant plant” does not create annual piles of dead dry vegetation (so it is usually perennial), has deep roots, is drought tolerant, and contains large volumes of water or sap (for its weight). Surrounding our buildings for example, we enjoy lots of berry bushes and ferns. Our dominant ground cover is clover. You can have trees on your property, but think carefully about location and variety. Some trees, like black spruce, for example, are NOTORIOUSLY volatile and should not be planted or retained anywhere near your structures. They burn like Roman Candles and explode – spreading embers. Branches close to the ground (up to 10 feet) can serve as ladder fuel, especially if they are dead and dry, and if leaves or needles create tinder piles beneath. Deciduous trees close enough to drop or blow dead leaves all over your roof are not in a safe spot – enjoy them a bit farther away. Finally, ensure that landscape trees are spaced far enough apart from each other – and buildings – that fire cannot leap from one to another. A rule of thumb is 20 feet apart or tree tops 10 – 15 feet apart at maturity. Our firemen advisers encouraged us to cut down four birch trees that were too close to our cabin and to take out two nearby spruce trees that were dying. b) Hardscape: Elements such as decks, benches, sculptures, and pathways close to the structures can certainly be incorporated but consider flammability. A path of wood chips from your door to the woods, fire pit, BBQ, or burn barrel could function as a fire path. Wood mulch should not touch an adjacent building. Two hardscape elements for many country homes are a fire pit for social gatherings and a burn barrel for trash. Position them intelligently, given the prevailing winds, surrounding vegetation, and proximity to buildings. When the wind is high, we never light an exterior fire, and we always douse ash from an earlier fire before retiring to bed. Our fire pit is half way between the lake and our cabin and about 40 feet from the branches of the closest (spruce) tree. It is dug four feet down and lined with rocks. The aesthetics are attractive, but the rock lining is practical, too. We live in the middle of a spruce forest in a river valley where the soil is highly peaty. It can burn. In prior years, we occasionally saw that a hot fire in the pit had ignited an underground root which was puffing smoking above ground, some 8 feet away! So if you are not familiar with the region where you buy the property, ask about the soil. It may sound weird to outsiders, but you want to know if it can burn or smolder. We are remote enough that we have no trash pick up service so, for burn barrels, we use two ½ barrels cut from a 55 gallon drum. To increase air flow, each is elevated on some logs and, before implementing their intended use, we perforated them in target practice. One houses a 6 gallon jug of water and serves as an extra container for large loads. Each is topped by metal screening, which keeps cardboard’s fluffy ash from floating on a breeze to somewhere else in the yard – important! Both have plywood covers to which “bear bells” are attached, alerting us to hungry predators acclimated to other cabins with unburned foods. Over the years, we have moved the burn barrels three times, seeking the safest location. This year, the position is in a low spot, below the prevailing winds, visible from a cabin window, where the bear bells are audible, and in a location we visit two or three times a day (near the chicken coop – so we won’t forget about it). We will see if this is the best location yet. c) Flammable Materials: Every country home I have ever visited is surrounded by all sorts of piles of this and that. Some are “works in progress.” Others are just unsightly accumulations of neglected junk. You and I might think that aesthetics alone would be reason enough to move or obscure them. Apparently not so. Pertinent to this article is any accumulation of flammable material near buildings and fuel. So I say in large letters: FIRE HAZARD – MOVE THEM AWAY! You can burn them, recycle them, or store them elsewhere, but DO NOT store a cord of firewood or construction supplies against the house. Do not leave dead tree limbs and piles of leaves next to propane tanks. I understand that an elevated structure offers convenient covered storage, but think about this: heat and fire rise. A fuel source under any structure is dormant tinder awaiting a spark. For goodness sake, crawl under your porch or cabin to remove cardboard, flammable containers, sawdust and pieces of wood remaining from construction. Use that space to store metal, cement bags, sheets of glass, row boats, canoes, skis, etc, but clear out anything that could catch fire from a nearby source, like a charcoal briquette or windswept ash. We corral all flammable liquids, including paint, in a 4 x 8 “fuel depot” building toward the rear of our property. The doors are made of fence wire. That allows plenty of ventilation but keeps bears out (they will chew on rubber hoses and tubes). Naturally, it has a metal roof (as do all our buildings) and is grounded to prevent sparks. Because we live in the middle of a forest, our biggest fire hazard is probably decades of accumulated woodsy debris. Each spring, as the snows recede and before rapid new growth occurs, we spend many, many hours depleting the tinder load beyond the “30 foot firebreak” encircling our cabin and outbuildings. (The area referred to in fire prevention manuals as “defensible space zone 2” is from 30 to 150 feet from homes and structures.) I rake through waist high dead leaves and grasses which we mulch to enrich the soil of areas we have previously cleared. Less useful flammables, like 8 foot tall devil’s club, branches, and floppy native grasses are tossed on enormous burn piles. (I am looking out the window at one pile 25 feet across and 10 feet high). We burn these only when snow safely blankets the ground, in early or late winter, as these fires can burn for several days. During this outdoor spring “cleaning,” we stumble over entire downed spruce and birch trees, some dangerously dry, hidden under years of birch and alder leaves. Rotting ones we leave in place, “unzipping” the paper birch with a blade to spill out future soil. 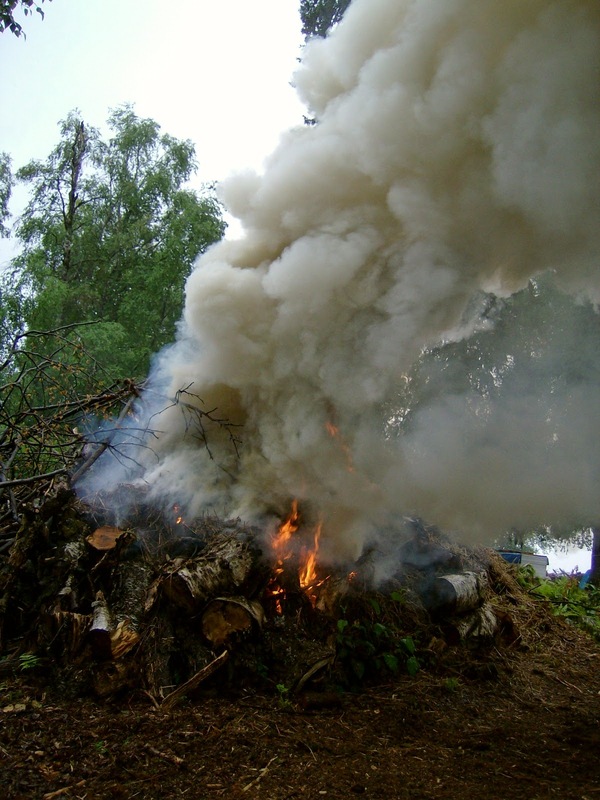 Other trees are assessed for burnability – in our wood stove (birch) or fire pit (spruce and alder). d) Emergency Access: We are float plane accessible only, so the following advice for on-road properties derives from a fire protection manual. Can a firetruck find your home? Make sure that your address (both street signs AND your number) are visible year round – not obscured by snow, foliage, faded paint or graffiti. Can a fire truck reach you? The answer is yes if the width of your driveway (plus verges) is 18 feet, and the heights of the encroaching tree branches are above 15 feet. A circular driveway offers good access as well as a broad firebreak. But is the area in front of your home or along your driveway crowded with bulky items, like cars, boats and storage units that would impede emergency vehicles? You don’t want to have to look for keys when your house is burning! e) Fire suppression/Water sources: Since we anticipate no outside fire suppression support, we have incorporated a number of resources recommended by firemen. Inside our cabin and several outbuildings are fire extinguishers (and a carbon monoxide detector). Outside the cabin and shower house are spigots with long hoses that can reach around each building and spray adjacent ones. Secondary structures without water sources (including the greenhouse, chicken coop, and power shed) are protected by several 55 gallon rain barrels each (which service adjacent gardens, too). We have also acquired two 300 gallon barrels that we will haul out this winter. One will protect the newly roofed wood corral and the other our power shed. For greater pressure, we bought a Honda gas powered lake pump and 450 feet of double jacketed, 1.5” diameter canvas fire hose with quick couplers on each end. Thus, among water barrels, hoses, a lake pump, and extinguishers, we hope we have multiple active and passive water systems to protect all of our buildings, should our preventative efforts fail. f) Communication and Evacuation: Some people avoid thinking about worst case scenarios, but if you have read this far, you are not one of them. So the last logical topic is what to do if your vicinity or property is engulfed in flames and you need to contact others and evacuate. If the fire is inside your home, you may not have access to your land line telephone service. Fortunately, many people rely on cell phones and often keep them on their bodies. However, in many remote areas, cell phone service is spotty or non-existent. So, depending on your location, it is prudent to have primary and secondary methods of reporting the fire and informing loved ones of your evacuation plan. What is yours? In our case, we have both telephone and ham radio access in the cabin and the power shed, some 450 feet apart. An evacuation plan includes “to-go” bags that are seasonally appropriate. We keep one in our plane (docked in front of our home) and one in our car (parked at a regional air strip). Spring and fall, we trade out clothes, batteries, and food, and every once in a while we update ID and credit card information. In addition, because we have a small home (750 sf), we store supplies such as clothing, food, camping equipment in various outbuildings. We may wear and eat odd combinations, but we hope that, should an emergency damage our home, we could salvage emergency supplies from other structures. The other component of an exit plan is a clear evacuation route. In our case, we have a boat and float plane on the lake in front of our cabin. Other, landlocked property owners or renters should ensure a cleared path to a safe spot away from the driveway or road if those are filled with smoke, fire, or downed trees. In woodsy areas, these paths will need to be maintained annually. Wildfires burn millions of acres in Alaska (and elsewhere) every year. Some are started by human error, but even more by chance lightning strikes. Prudent preparation and ongoing vigilance are intelligent responses to such hazards… even for those near a firehouse, but especially for those more remote.